The Cherry Creek School District is Colorado's fourth-largest school district and is one of the highest achieving in the state. We are located in the southeast Denver metropolitan area, educating more than 54,000 children and serving over 300,000 residents in 108 square miles that spread across four municipalities: Cherry Hills Village, Centennial, Foxfield, Glendale, Greenwood Village and parts of Aurora, Englewood and Denver. Our District continues to grow. Colorado ranks in the bottom ten states in the nation for K-12 spending per $1,000 of personal income. The challenging state budgetary environment has limited the money available to fund public schools. In this challenging state budgetary environment, combined with the growing and changing demographics of the District, the Foundation's work is even more critical to ensure that every student has the OPPORTUNITY to achieve to the best of his or her ability, at each and every level. 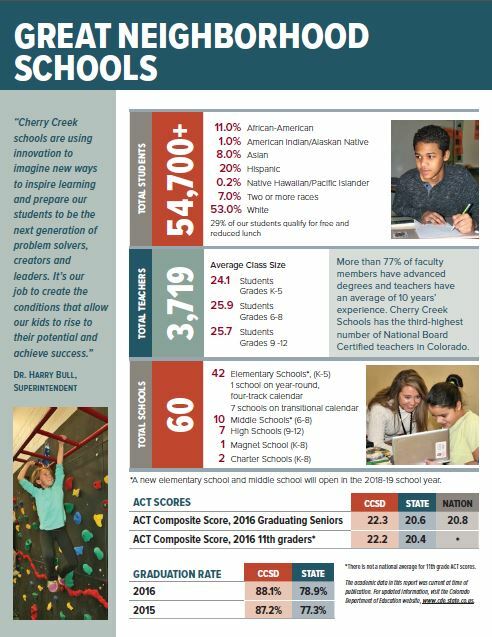 For more information on Cherry Creek Schools click here.